I sometimes find Marty’s clowning and boosterism amusing, as I did during the 2005 transit strike. I remember walking over the Brooklyn Bridge during my long trek home from my office near Penn Station, as tired and cold as everyone else that week. As I reached the Brooklyn side of the bridge, there was the borough president, greeting people with a cheery smile and a hearty “Welcome to Brooklyn!” What else could any of us do in that situation but laugh? Sometimes a place like Brooklyn does, in fact, need a cheerleader. But other times it also needs a champion, someone who will stand up for what’s right. Unfortunately, the truly shameful recent behavior of our borough president not only shows that he’s up to the challenge, but that he may actually not care to take it on. 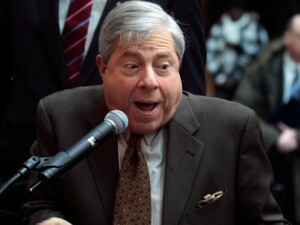 Updating Streetsblog’s recent rebuke, Marty Markowitz was on CBS2 twice already in the first three weeks of 2011, using both appearances to denounce street designs implemented to improve safety for everyone, especially pedestrians. Marty did not, however, take to CBS2 to denounce or even comment on the car accident that claimed the life of an 83-year-old rabbi named Mosha Adler, visiting from Israel. He did not, to my knowledge, appear on CBS2 to make a statement about Patricia Maschuca and her 9-month-old twins, Gustavo and Daniel, visiting from Baltimore and injured in an accident involving a livery cab and a double-parked car. Nor did he take to the CBS airwaves to mention anything about a three-year-old toddler in Williamsburg, nearly crushed to death by a van that ran him over as he was being pushed across a crosswalk by his sister. I wonder, as Streetsblog does, if Marty is even paying attention. This is not about the bike. It is about Marty Markowitz, who is just as incensed about tiny pedestrian refuges in Midwood as he continues to be about one mile of green paint and stripes on Prospect Park West. More clearly, this is about whether or not Marty Markowitz values–or even notices–the health and lives of the many over the cars and personal convenience of the few. From my perspective, the real, verifiable human tragedies involving the elderly, mothers, and children do not seem to be worthy Marty’s time, at least not when they also involve cars. However, the imagined and statistically-unlikely worst case scenarios involving bikes and islands of cement have motivated him to take to the airwaves at least twice so far this year. And there’s still a week to go in January. Please, someone tell me I’m wrong. Point me to a TV news report that aired in the wake of those tragedies in which Marty even offered one statement of sympathy for the victims and their families. I’ll apologize for this post immediately. Because that’s what adults do when they are wrong. Marty is so bad for Brooklyn. He claims to be a booster but what does he boost? Chain stores over local stores and drivers over safety. He might fall down break his leg and sue Brooklyn when he is no longer President and retire. I expect an apology from Markowitz in roughly the same time-frame it took the Catholic Church to apologize to Galileo – and then add 5o years. This is an exchange I had with his office concerning Emilie Gossiaux, the cyclist who was struck by an unlicensed truck driver, while riding her bike. She is now blind.